Decent mech modes (Chewy is better than Han though), interesting transformations, rock solid and HIGHLY detailed vehicle mode. Recommeded! 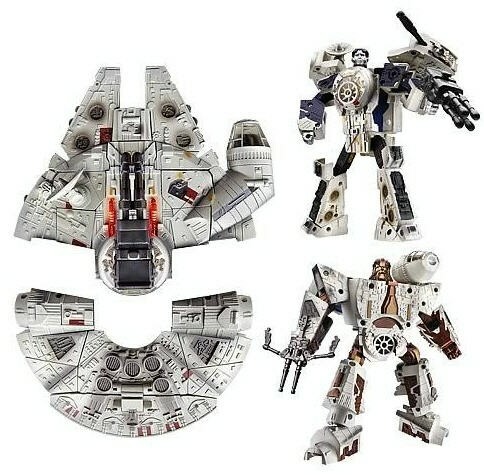 The Millenium Falcon Transformer is two robots, one shaped vaguely like Chewbacca, the other like Han Solo. Each is between seven and eight inches tall, and is more poseable than the Transformers I grew up with. They each have their own weapon--Han some kind of pistol, and Chewbacca his trademark bowcaster. Each fires projectiles, and has a sound chip that will either make blaster sounds, or quotes from the movie when pressed. 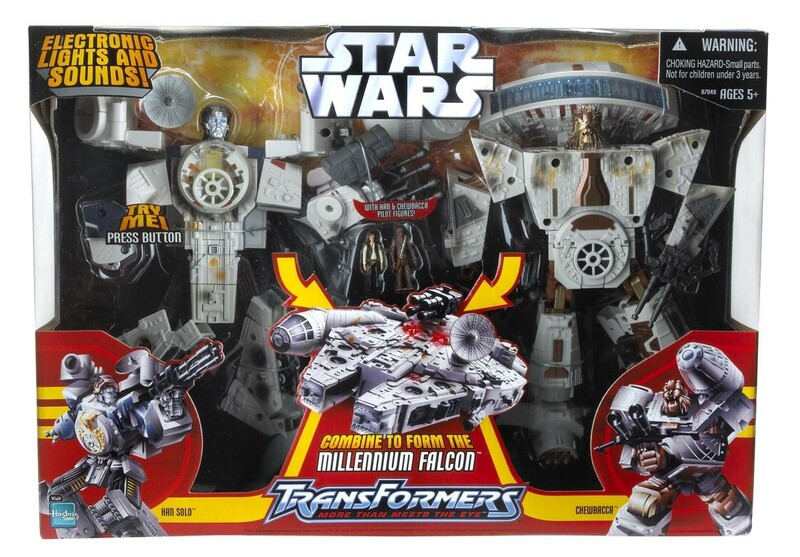 The real appeal of this toy, of course, is that the big honkin' robots can combine and transform to become the Millenium Falcon--one of the most iconic ships in the original Star Wars trilogy, and one of my favorite spaceships ever. The transformation process is more complicated than I'd like for my young sons, but is still manageable. Han Solo becomes the front end of the ship, and Chewbacca the rear. Thankfully, Hasbro includes a page of instructions that helps the Transformer-deficient to accomplish the task. There are 27 steps to turn the two robots into the spaceship, so until you get those steps down, don't lose the paper. Once the Millenium Falcon is formed, it's about 9" long and 7" wide--it's a good scale to swoosh around the room, and I'm impressed with both the ratios and the level of detail that Hasbro packed into the ship. The blue engines light up at the back of the ship, and red lights show up where the blaster cannons fire. Landing gear fold down to land the Falcon safely, and tiny Han Solo and Chewbacca figures fit nicely in the cockpit and inside the blaster turret. Lights and sounds are provided by 4 AA batteries, which are all included when you buy the toy. This is our first of the Star Wars Transformers, and it's more fun than I thought it would be. Miles isn't quite up to transforming it himself yet, but enjoys playing with it both as robots and as the spaceship. If you can find it on sale, pick it up--it's a great addition to any Star Wars or Transformers collection.